Heroes are strange beasts, as is memory. Nirvana never were particularly the former for me, but are very much part of the latter. Retrospectively 25 years on almost to the day it’s still quite nice to know you were present at the stuttering birth of a new squalling brat, and that’s where my relationship with them small though it really is begins. In the physical sense of the past for me and a few hundred others they were born in Norwich the 30th of October 1989, their first appearance in the city double headlining with Tad, supported by a local fun loving beat-combo Brain Drain 69 who didn’t play because they’d just split up, which is slightly unfortunate for them. I can’t remember a huge amount about the night. I worked along with Andy Bailey and various others behind the bar at Norwich Arts Centre for about six years, it all turns muddy with time. NAC is a place with a long history, not just the institution, the building as well, Not many venues are converted medieval churches, nor ones where the tower collapsed that have been regenerated countless times, NAC or Premises as it was known to a lot of us in the early eighties is one. Andy and I always tried to work the music nights as it meant we got to get paid for seeing bands or bits of bands depending on how busy it was. Nirvana was a good example of quite busy, but not so bad that we were stuck behind the bar all night washing glasses and filling them again in exchange for people’s hard earned cash. Several bits of the night stand out in between pouring lager on my feet and picking up glasses. Andy was full time, he also did days, I was part time; mainly evenings, usually four nights a week, this involved rushing from one low paid job; a paste-up artists for a small printer on an industrial estate; to home to change and then into work at another low paid job for about six working until midnight then repeating it the next day. Sometimes I got to look at my at that time fairly freshly born eldest daughter and see Jen my partner for half an hour, possibly shovel some food in and then leg it off to job two. And sometimes I didn’t. On this occasion I didn’t, so Mother and Child came to the Arts Centre and had a cup of tea and said hello, possibly making our three month old the youngest child at a Nirvana gig, who knows. They went home before the noise started and any crowd of chain-smoking proto-grungers formed and we got on with clearing up the bar, changing barrels and setting up the pots and cleaning things. The nice thing about The Wilde Club was the familiarity, everyone sort of knew everyone else in at least a nodding manner. Barry who ran it is still a friend, I still see lots of the people who used to go and drink, block the urinals with vomit and lurch about in the slippery semi-darkness. Most of them have less fringe to peer out from under these days and most have bigger stomachs and bigger collections of vinyl. We’re maybe all slightly less inclined to go and get sweaty in a venue, although most of us still venture out now and then, but we’re mostly still about and in contact virtually or physically. It was a club after all, and a tremendously important one for Norwich because, Nirvana aside, Barry and Ollie also hosted countless other bands over the lifetime of the club, I can’t remember lots of them; they’ve vanished into the confusion of memory, but a few of the ones that stand out of the mud like sticks are My Bloody Valentine who remain a large noisy shape in my consciousness. 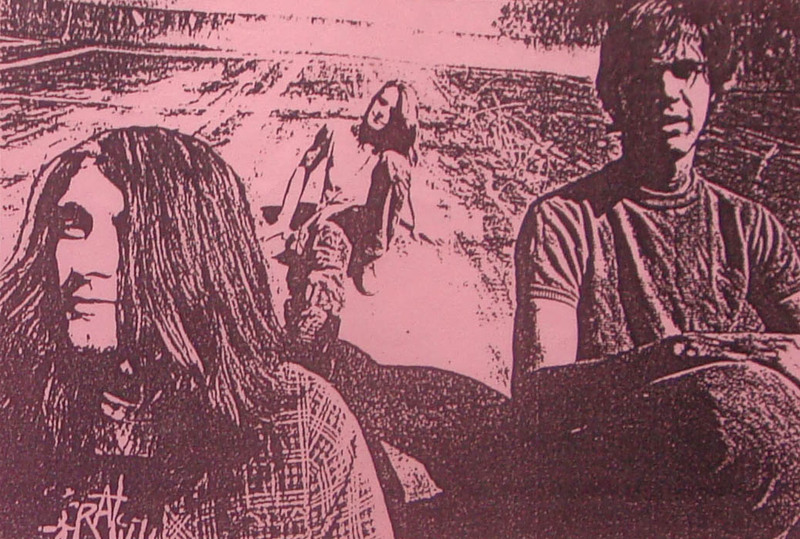 The Drop Nineteens with their American slant on Shoegaze, Ride, who burned brief and bright, Curve which was rammed, Also King of the slums and Dubsex, The Cardiacs, Slab! ; ridiculously underrated noiseniks, Mega City Four, Delgadoes, Ash, Mudhoney, Birdland, Manic Street Preachers, Cornershop, HMHB, Thee Hypnotics, The Telescopes, The Lemonheads and The Shamen (pre-Es, it was empty), I’ve forgotten loads and I’m no longer sure if Barry put them some of them on or not, as they may have been the earlier Weh Aye Cocker and Monkey Clubs in some cases. My Bloody Valentine played twice, once under the Monkey Club banner as far as I can remember, they supported by The Shamen in an earlier guitar driven guise. The list goes on, in fact a complete list would be nice. Because it’s easy to forget what people have given the city and Barry Newman and Ollie Redmayne gave us a lot in the late 1980s and early 1990s, most of it making no money whatsoever, what it did make was invariably ploughed back into the record label and promoting more bands. It’s also important I think to remember the chances given to a lot of local musicians to support major acts and test their mettle or metal on a proper stage. The list again is a long one and it included me sweating and trembling several times. It also provided something for that musical CV. 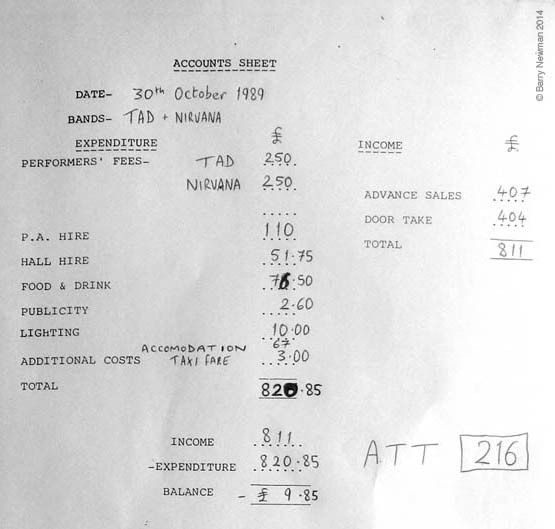 So a big Baz McHat-tip to them both.You can see here that the stellar door-take for the Nirvana gig was £9.85. Attendance 216. While we were setting up another friend turned up towing a tall skinny chap and introduced him to me as ‘another bassplayer’ which was part of what I was trying hard to be at the time. His name was Kris, Dave bought us both a drink and we sat at one of the scabby black painted tables I’d just wiped, we talked about bass-playing things, absolutely none of which I can remember now, because they were just another band, then he went off and did a sound check and all that band stuff that becomes part of the humdrum landscape of venues and music and earning a crust out of it. I think there were possibly three bar staff that night although I can’t be sure, we used to always routinely argue about who got to see which band, I won and got the headline, Tad. Andy lost and got Nirvana. He lasted one song and came back saying he didn’t like them especially, so I put on my ready to be cynical hat and went in and stayed long enough to watch them do Mr Moustache which was the only song I actually knew and was particularly bothered about. This was swiftly followed by legging it back to get ready for the inter-band bar frenzy. That’s it, that’s the extent of it, the world didn’t tip off it’s axis, there were no unicorns riding rainbows or fiery horsemen it was a gig. It was okay as they went. At the end of the night from somewhere some copies of ‘Bleach’; the first album magically appeared and were handed out by Barry to a few of us which was nice, I still have mine, it’s black vinyl in VGC, the cover is in quite good condition. It’s had a few outings, but of course it was the next two albums that made Nirvana what they became, ‘Nevermind’ still resonates with me, it’s one of the first albums my eldest daughter liked, as a toddler she’d craze me for that and later moved on to Seether by Veruca Salt which was the first CD I ever bought as far as I can remember. This was followed by plundering my stock of Pixies, a habit she has kept up. 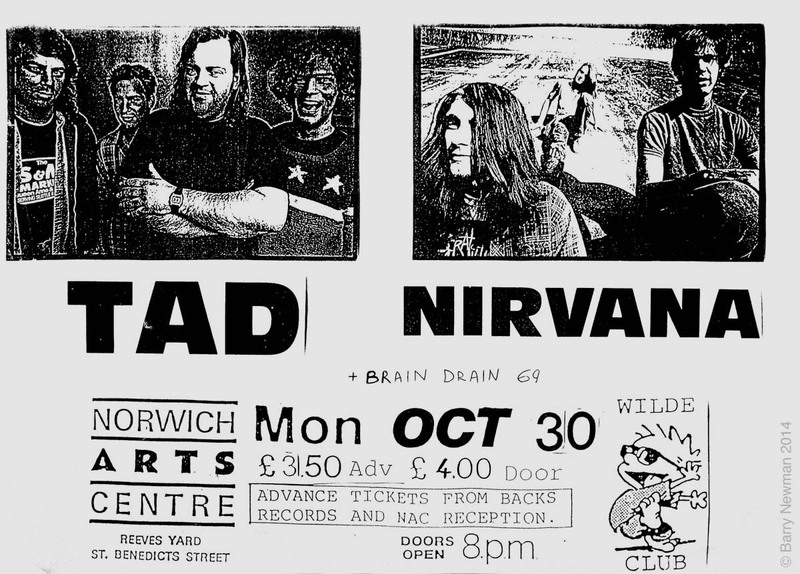 Nirvana came back, they played at the Waterfront at another Wilde Club, I went to that too, but as a punter and can remember absolutely nothing about it whatsoever, which should be odd but isn’t for some reason as I also can’t remember Mogwai either who I love. It wasn’t long after this of course that they became what they remain. 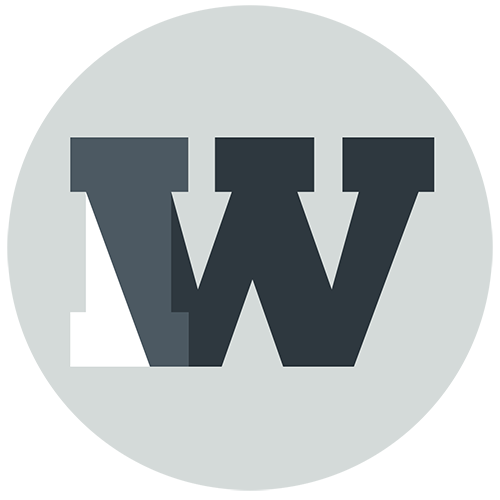 Addenda: 1st March 2016: You can here the set here, thanks to Richard Shashamané for pointing it out. Being born in ‘94 I’m a million miles away but I’ve always been big fan of Nirvana, so I half jokingly thought I’d search online to see if they ever visited Norfolk. I was absolutely sure I wouldn’t find anything at all so to find out they played here not once, but twice really blew me away.